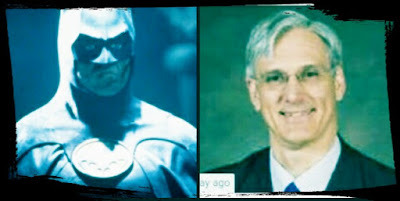 Cahnman's Musings: Is Tim Dunn BATMAN?!? There has recently been a campaign deploring the influence of "outside groups" in elections. It is important for taxpayers and voters to understand that the primary outside group the insiders fear is us -- the educated and motivated voters. For years, insider incumbents have relied on financially dominating their political opponents in order to win over voters and avoid scrutiny of their voting record. Yet efforts by "outsiders" to shine a light on what really happens inside our state capitol is causing a fundamental shift in the status quo. This can be demonstrated with a few numbers, beginning with 1.5 percent. That's the approximate percentage of all campaign spending attributed to the Empower Texans PAC (ETPAC), the main outside group identified by the insiders as their political bogeyman. If you presume most of the other 98.5 percent of funds support insiders, the disproportional fear of ETPAC shows its efforts clearly pose a threat to insiders. As of the end of February, $113.5 million had been spent on Texas legislative and statewide campaigns during this campaign cycle. Of that, $1.6 million was spent by ETPAC. That is a lot of money, but a small portion of the total. So why the fuss? Because the distinction insiders make is that ETPAC is an outsider. That means ETPAC is willing to take the often unpopular stance of backing challengers against insider incumbent politicians. It also means that what the insiders loathe is having their voting record exposed in primary elections. Bottom Line: Tim Dunn is a Billionaire who fights criminals and hates corruption...where have we seen that profile before?! ?